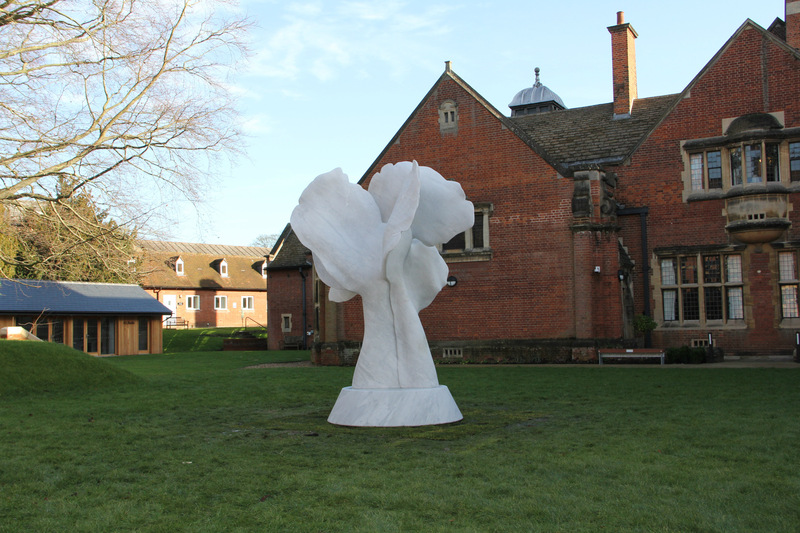 Standing at 3 metres tall, sculpted from a 42 ton block of marble and weighing 5250 kg, the Woolf Institute’s new sculpture ‘Tree of Life: Encounter’ was officially unveiled on Sunday 11th February. 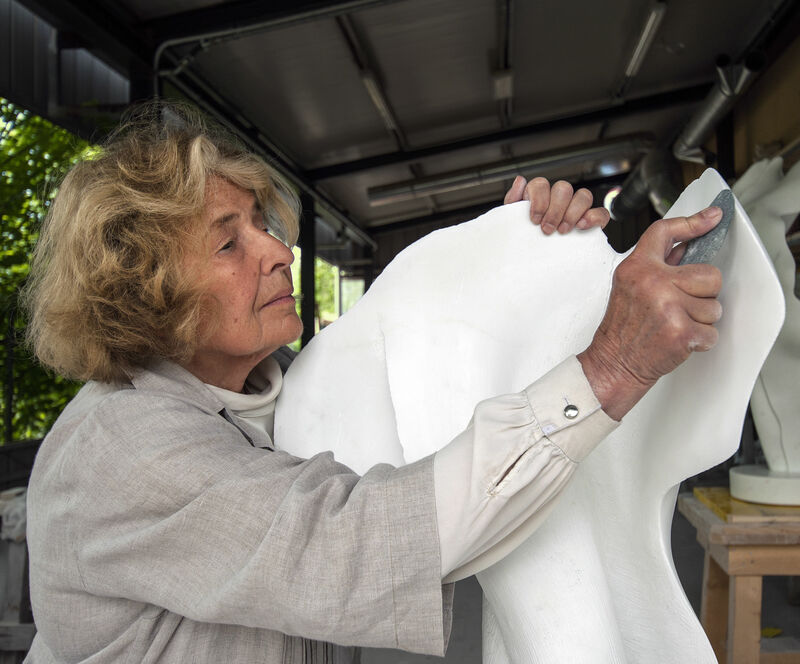 Created by renowned sculptor, Helaine Blumenfeld OBE, the unveiling marks the Woolf Institute’s move to its new, purpose built headquarters. Having created more than 90 sculptures – including ‘Fortuna’ in Jubilee Park at Canary Wharf and ‘Flame’ at Clare Hill in Cambridge – Helaine is an internationally-acclaimed sculptor who has worked extensively in the public sphere. Ahead of the launch of this latest commission, DesignCurial were lucky enough to be offered the chance to speak to Helaine to discuss her sculptures, her inspiration, and why working with the Woolf Institute has been so special. Helaine reveals that she has always known she was an artist, but at the beginning she thought her medium was words and language. However, “the more words I had the less I was able to express anything… I realised I needed something that was an extraordinary language, but I didn’t know what that was”. She came upon sculpture as an art form almost entirely by accident, during a visit to the National Gallery in Naples. “We can across these little terracotta pieces and I was just astounded how these tiny things told a story; and I said, ‘You know what? I want to do that. I want to do sculpture’ - and I’ve never looked back from that”. Though her sculptures are often giant pieces of public art, Helaine explains that they always start much smaller, with a much more malleable material in comparison to marble or bronze: clay. Splitting her time between two studios, Helaine spends half of her time in Pietrasanta, Italy, and the other half at home in Grantchester, near Cambridge. It is therefore no surprise that she has had several public commissions from the city and University colleges; this brings the conversation around to whether Cambridge - which is also the home of the Woolf Institute - holds something special for her. “If you’re talking about putting beauty in the world,” she continues, “you’re not talking about putting it in someone’s home where no one else is going to see it. I feel, more and more, that I have an ambition to put work into public space and in the world, so that people can discuss it and bring their own perspectives because people see things so differently. I think beauty takes you out of yourself in that moment and you’re in a place where you see things differently”. Her latest monumental sculpture, created for the Woolf Institute, is called ‘Tree of Life: Encounter’ and was created out of a block of marble from the famous quarries in Carrera, Italy – the same marble used by Michelangelo for his sculptures. When asked why marble was chosen for this latest piece of artwork, Helaine admits that, as it was commissioned by the Woolf Institute, they were the ones to choose the material. The official unveiling of ‘Tree of Life: Encounter’ at the Woolf Institute also marked the final day of filming for a new documentary film by Sky Arts that focuses on Helaine’s life and work, titled Hard Beauty. The film follows the creation and development of this latest commission from its very beginnings – when the new Woolf Institute headquarters was just a building site. “If I was asked what has been one of the major problems in our world,” Helaine muses, “it would be overcoming apathy and restoring empathy, and reviving the beliefs that there’s something higher – it doesn’t have to be God, but just a spiritual value that’s higher than the material. It doesn’t have to be yours or mine. We’re human beings and we’re united in that – that’s really what the Woolf Institute is trying to [show]”. Helaine explains that she has even, kindly, “done the art itself without a fee.” The gallery that represents her have accepted those wishes – instead, the Woolf Institute have only been asked to “pay for the marble and the [carving work] because I really believe in what they are doing”. After working for nineteen years to build relations between Christians, Jews and Muslims, the Woolf Institute can now officially mark their move to their new headquarters with the unveiling of Helaine’s beautiful ‘Tree of Life: Encounter’. 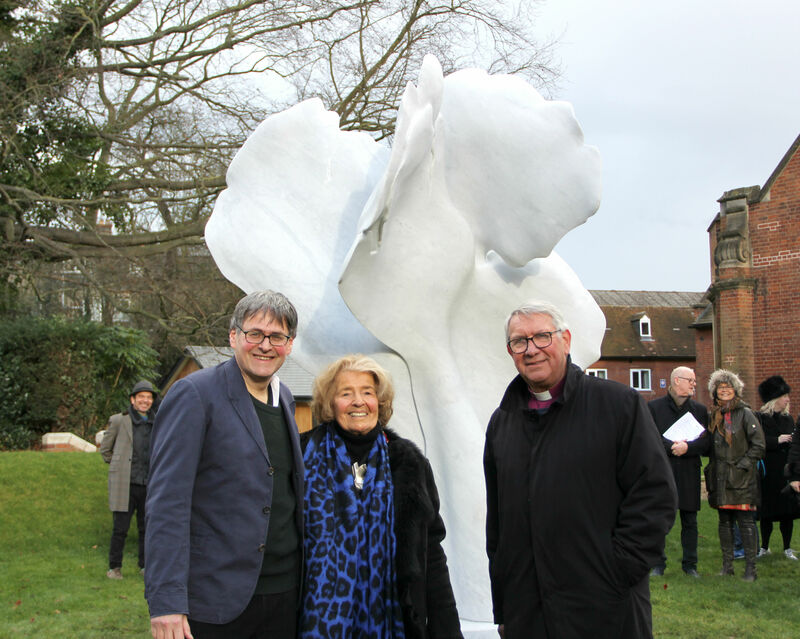 The sculpture was revealed by both Helaine and the founder-director of the Woolf Institute, Dr Edward Kessler MBE, on February 11th in an official ceremony. The ‘Tree of Life: Encounter’ is now open to the public, and can be viewed by visitors in the Woolf Institute’s courtyard - a bright symbol of dialogue, peace and understanding.